Background: Tremendous efforts through dedicated research have been made for the development of robust, point of care, portable, cost effective, sensitive and specific assays of microbial detection. Biosensing and nanotechnology offer novel strategies of designing state of the art devices and assay formats with enhanced sensitivity and all other desired features. Monoclonal antibodies have been in use as biorecognition elements for decades. However, recent studies have demonstrated superiority of aptamers to monoclonal antibodies in a number of applications. 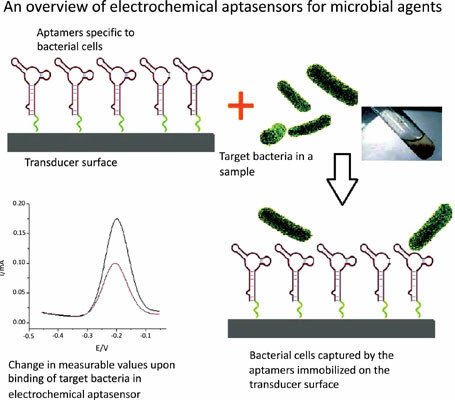 Many of the research groups have successfully utilized aptamers as capture probes in developing biosensors for microbial detection. Objectives: The main objective of this review article is to present the reader with an overview of the recent advances made in the field of aptamers and aptasensors for the detection and identification of microbial agents. Results: Our search for relevant information on current advances on aptamers and aptasensors has revealed that a number of successful attempts have been made in the last two decades for the selection of aptamers as well as their applications in aptasensors for microbial detection. Conclusion: Aptamers and aptasensors, although in their infancy, may find promising application in rapid, sensitive, point of care and cost effective microbial detection. SELEX, aptamers, microbial recognition elements, advanced microbial detection, biosensors.